Enjoy our beaver printables - including a cute little beaver jigsaw and some beaver notebooking paper to use for your research projects, perhaps. Keep animal-loving kids busy with this beaver grid copy. Using the image on the left, copy square by square until you've completed your own drawing! Here's a fun jigsaw of a beaver to print and play with the kids. You will need our jigsaw instructions and cutting guides. The beaver is the national symbol of Canada, use our beaver notebooking pages to help you find out more about why these cute creatures are so important. Decorate your wall with this beaver poster. It would be great as part of a display of animals which live near water. Did you know that the beaver is the second-largest rodent in the world? Here is a photo of a beaver taken in its natural habitat ... a pond or river. Beavers building a dam is the theme for this beaver scene poster. Display as part of a wildlife or Canada themed display. Tracing around the outline of this beaver picture is great pencil control practice. Young children will enjoy the feeling of "drawing" and can then finish off by colouring in the picture. Do you know someone who is as busy as a beaver? It might be fun to send them a note on our beaver writing paper. There are lined, blank and handwriting versions to choose from. This beaver is missing a face and tail, so get out the crayons and get busy completing the beaver picture on this fun printable! Look closely at the picture of the beaver on the right to help you add the missing parts on the left on this fun complete the beaver puzzle. It is very satisfying to be able to draw something freehand. 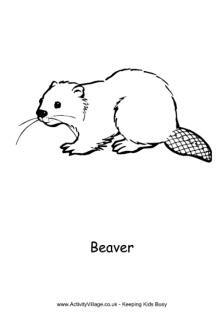 This learn to draw a beaver activity takes you through, step by step, until you have your completed picture!